While this seems like a genuinely good thing, not everyone responds to getting a promotion the same way. 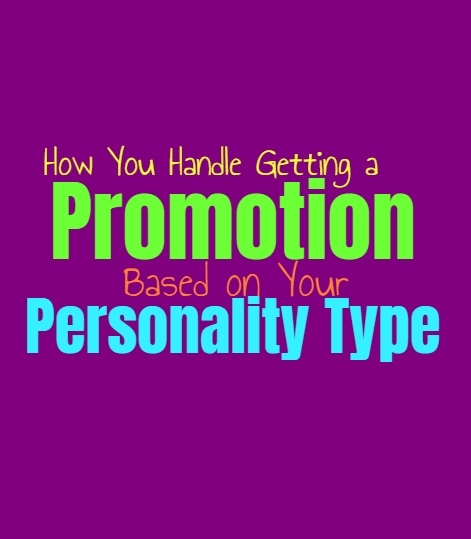 So here is how you would likely respond to a promotion, based on your personality type. INFJs do care about being someone who can progress and impress their loved ones. They are perfectionists who really don’t like failure but at the same time they can be a bit nervous about this type of change. INFJs might be afraid of what a promotion means, since this can be a lot of pressure on them to perform a certain way. While INFJs do want to be someone who can move forward and a promotion feels good in some ways, it also makes them a bit anxious about the pressure. ENFJs definitely enjoy receiving promotions and often work hard to achieve this. They don’t like feeling stuck and really want to be able to work towards building a future. For the ENFJ accomplishing their goals is truly important, since they want to be able to impress and care for their loved ones. A promotion does mean added pressure for them to perform, but at the same time they enjoy the opportunity to challenge themselves and become what they want to become. INFPs sometimes take a promotion as more pressure to perform and follow the rules of their job. For them this can seem like a lot to take on and so they might be hesitant at first. The way they truly respond to a promotion often depends on the job they are doing and if it is something they enjoy. If the INFP is doing something they are passionate about, then getting a promotion feels like a sincere accomplishment and is something they will be proud of. ENFPs do enjoy receiving promotions since it makes them feel accomplishing and proud of what they have done. They want to be able to advance and enjoy taking on new challenges. Remaining stagnant without promotions or growth would be much worse for the ENFP, and they will gladly take on the change. For them it is rewarding to dive into their promotion, and take on this challenge and experience with a sense of excitement. For the INTJ a promotion is just another stepping stone towards building the life they want. They don’t accept stagnancy or mediocrity and believe in pushing towards achieving their goals in life. For the INTJ a promotion is important and often something they are working towards in their lives. They work hard to be efficient and to get things done, and so a promotion is simply part of their goals. ENTJs definitely value their promotions and are happy when they can work towards achieving them. They believe in being efficient and in progressing towards their goals in life. When it comes to promotions it is something the ENTJ expects from themselves and they won’t give up until they continue to climb the ladder and progress in their jobs. They don’t accept stagnancy in their in lives or their careers and so promotions are a part of their goals. INTPs do care about promotions when they are working in a career which matters to them and they are passionate about. For the most part INTPs want to be able to work towards achieving their goals, but they don’t like feeling stifled in a position which doesn’t give them room to advance the way they want. For the INTP promotions are important, as long as they are moving up in a direction which gives them more freedoms and space to do what they want. ENTPs definitely become excited about promotions when it is something which will challenge them and help them move forward. They want to be able to experience new things and push themselves to take on these goals and challenges in life. For the ENTP a promotion is just another change to shake things up and they likely feel proud of their ability to achieve these accomplishments. ISTJs definitely value receiving a promotion and they take this commitment seriously. They work hard to accomplish their goals and moving up in their career is definitely part of this. For the ISTJ a promotion does mean added pressure but they are prepared to take this on. They don’t want to fail themselves or others and will work hard to become efficient and capable in this new position in their careers. ESTJs definitely take their commitments seriously and so receiving a promotion is something which is important to them. They work hard to advance in their careers and definitely have goals of receiving promotions and moving forward. For the ESTJ a promotion means they are doing something right and they are definitely proud of this. This definitely means more work and added pressure but they are certainly willing to take this on. ISFJs are often happy when they receive a promotion because it proves that they have accomplished something. ISFJs care about doing things right and want to continue to build a life for themselves and their loved ones. Promotions are a sign that they are valued in their jobs and this definitely makes the ISFJ happy. It can feel like added pressure to perform which might make them a bit nervous, but that likely won’t stop them from accepting it. ESFJs are definitely happy with promotions since they want to be valued in their jobs or careers. ESFJs take pride in their work and want to be someone who makes their loved ones proud. For them it is important to take this seriously and so it can cause them a bit of anxiety knowing that they have to perform at a different level. ESFJs can be nervous about promotions but they are often very happy about them as well. For the ISTP a promotion is something they can be proud of, especially if it is working towards a job they truly want. They care about advancing and don’t like feeling stagnant in their lives. Being stuck in the same mundane job forever would be far worse than receiving a promotion and getting a chance to shake things up. For the ISTP a promotion can really give them a chance to challenge themselves and experience something new. ESTPs definitely feel a sense of pride when they receive a promotion, since they enjoy being noticed for their accomplishments. They dislike feeling stagnant or stuck in the same position for too long and really want to work towards advancing, When it comes to promotions the ESTP really wants to have room to move up the ladder, and are often excited for the challenge. ISFPs do care about receiving a promotion when they are in a career which fulfills and excites them. Otherwise this type of thing can actually give them anxiety and leave them feeling a bit stressed. They don’t like added pressure, especially in a career which doesn’t leave them feeling rewarded and passionate about coming into work each day. ESFPs do find a sense of excitement in certain promotions, especially since they enjoy feeling valued. For the ESFP it often depends on their career and if they are doing something which they love and are passionate about. For them it entirely depends on the job, since too much added pressure is something they don’t really enjoy taking on. For them to be happy about a promotion then they have to really love coming in to work each and every day.